We are so excited with our latest Instagram TAKEOVER this time with @before.1st.light – Jane Schultz. Schultz is a respected and established artist and has been granted full access to our Instagram account and she is doing such a magnificent job. We are very proud of her! This is the third TAKEOVER we have commissioned, our first time was with @psychephoto – Robin Cohen, our second with @lee_atwell, both of which have exquisite taste and talent. On Day 3 @before.1st.light highlighted an artist whom we greatly admire, she is incredibly talented, she writes “Today’s feature is by @lorenka Lorenka’s deeply emotive, taking us from our depths to a place which is spiritually uplifting and a journey within her heart. Thank you for sharing your wonderful work with us Lorenka ”. 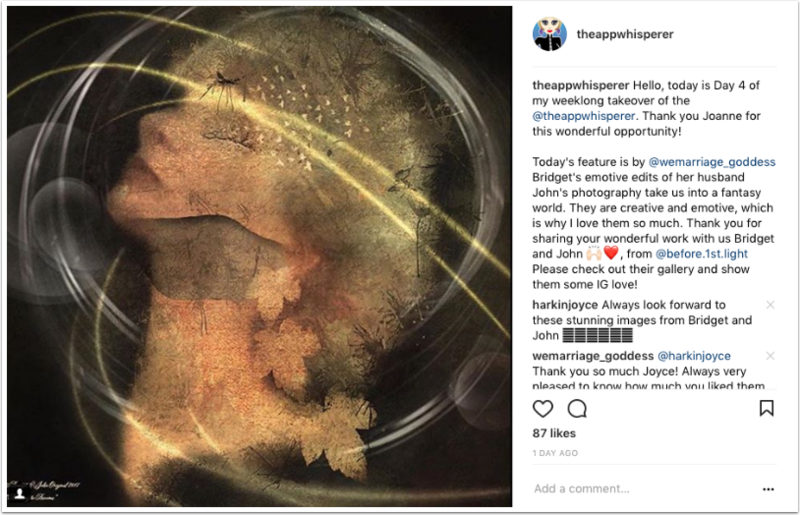 On Day 4 and we were delighted to view @before.1st.light next selection, an image by @wemarriage_goddess, a very talented husband and wife creative team, Bridget and John, she writes “Bridget’s emotive edits of her husband John’s photography take us into a fantasy world. They are creative and emotive, which is why I love them so much. 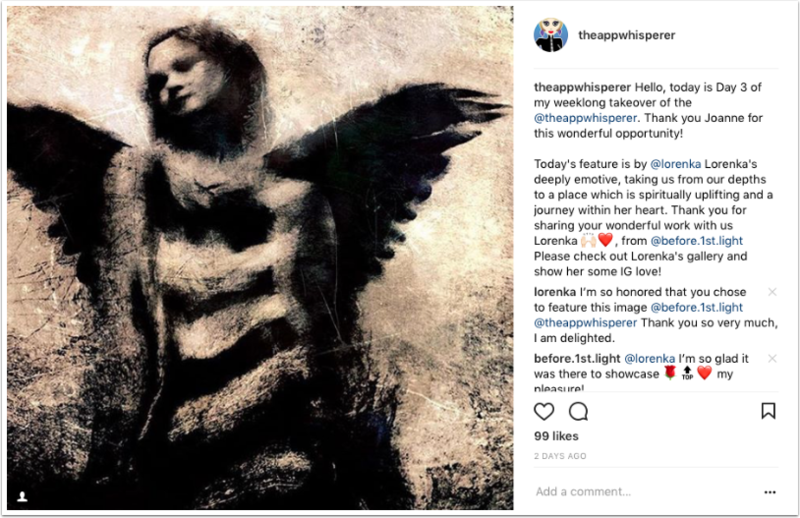 Thank you for sharing your wonderful work with us Bridget and John ❤️“, on Day 5, @before.1st.light featured the wonderful artistry of @mobilestorytelling – Angie Lambert and said “Today’s feature is by @mobilestorytelling. Angie’s art takes you into her dreams with stories sparked into the viewer’s imagination. 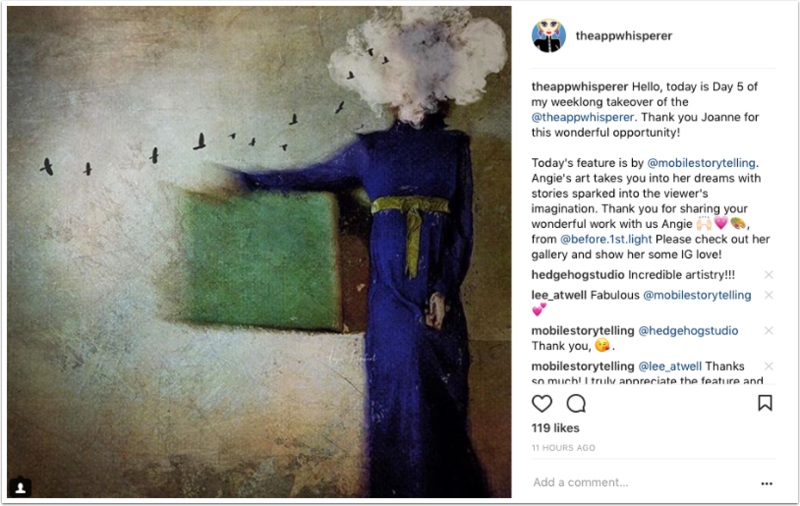 Thank you for sharing your wonderful work with us Angie , from @before.1st.light Please check out her gallery and show her some IG love!”. We were also suitably graced on Day 5 with @before.1st.light’s incredible own work too, how incredible she is! We are so lucky to have her and we are eternally grateful. If you want to keep track of all that @before.1st.light views, please head over to our Instagram feed, here. 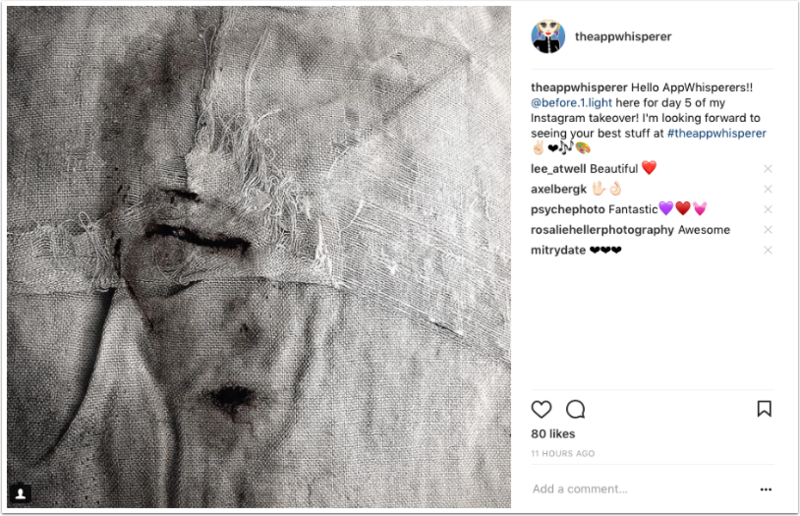 Please tag your images with #TheAppWhisperer if you hope to be found and possibly featured.